With Easter right around the corner, I have a few last minute gift ideas to share. There’s been a lot of delicious desserts around here lately and I figured it was time to bring on the savory. 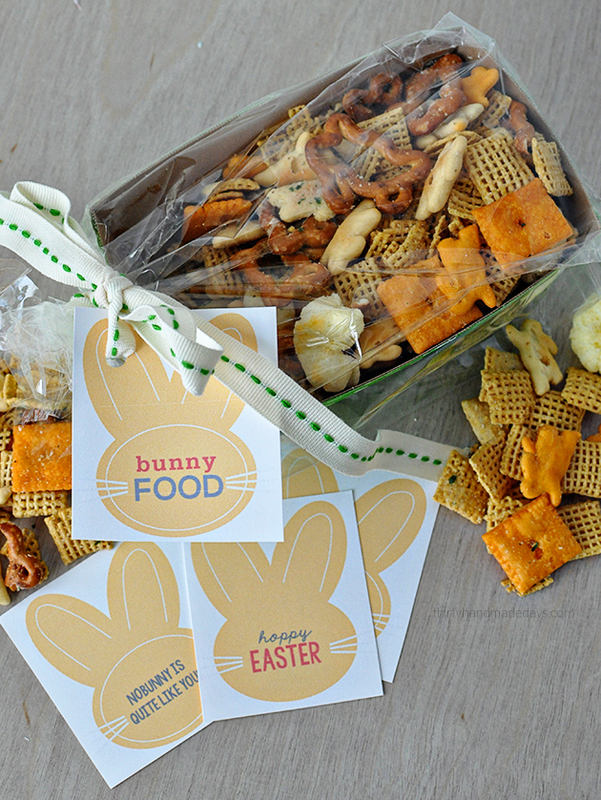 This “bunny food” is easy to put together and the tags complete it. Take a look at my bunny project and then see what nine of my blog friends did with the same theme below. I grabbed the basics at Target (because I’m there 5 times a week, ahem). They have seasonal bunny pretzels because of Easter and always have Annie’s Homegrown bunny crackers in a couple of flavors in stock. 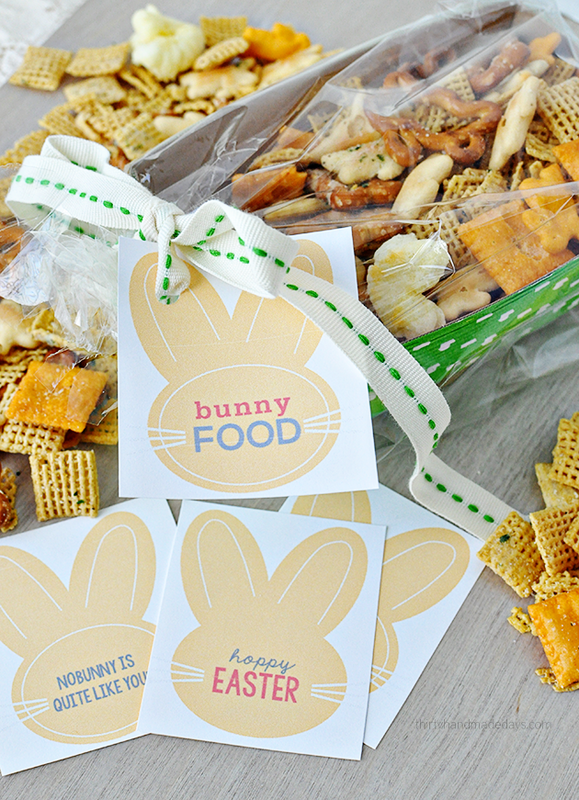 I also picked up some cute spring-y bread wrappers and used those to fill with the snack. It takes under a minute to rip open boxes and bags to combine this mix. And yum! 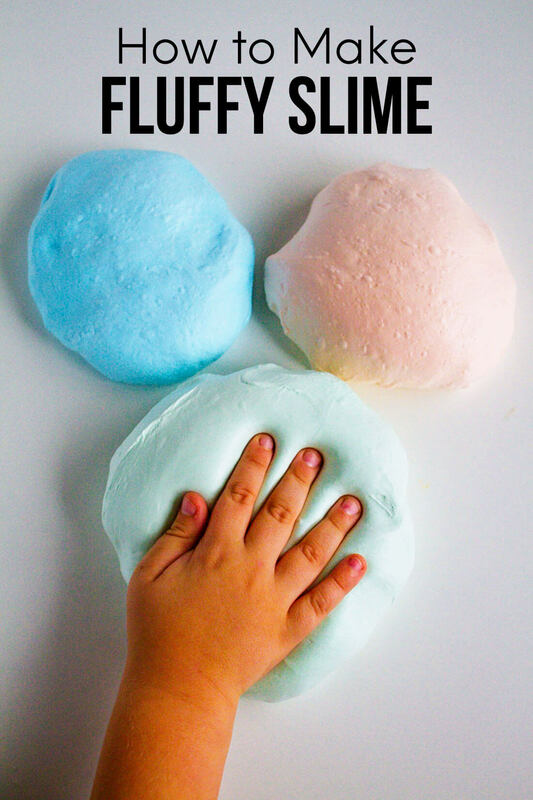 The perfect after school snack or treat to munch on anytime. 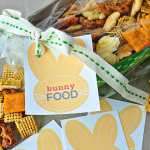 "Bunny Food" is such a fun Easter gift idea! Simple to put together and a fun snack to deliver to friends and family for the holiday. You can punch up the flavors by adding ¼ cup melted butter and 1 package Hidden Valley Ranch Dressing. Toss over mix and stir. I have a big stash of cardstock and cellophane bags because of all of the printables I make. So I decided a few versions of bunny tags, printed them out and attached them with a cute ribbon. Ta-da! 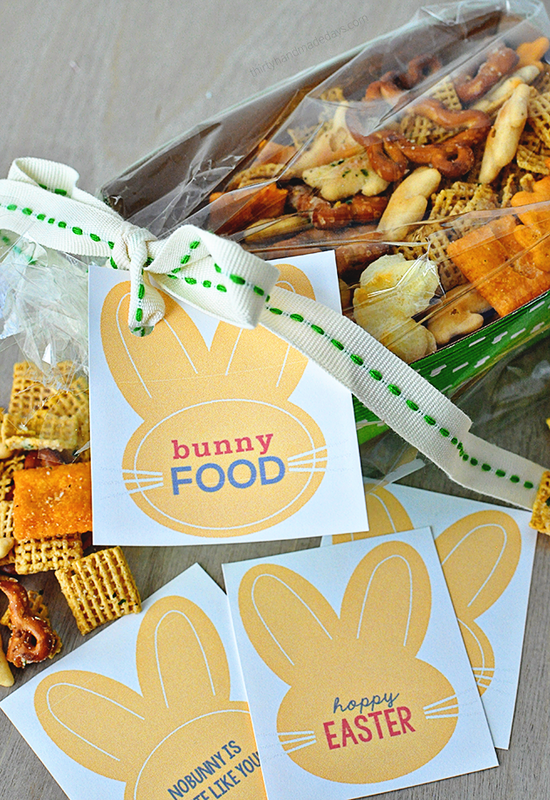 A cute, savory Easter treat for family and friends. 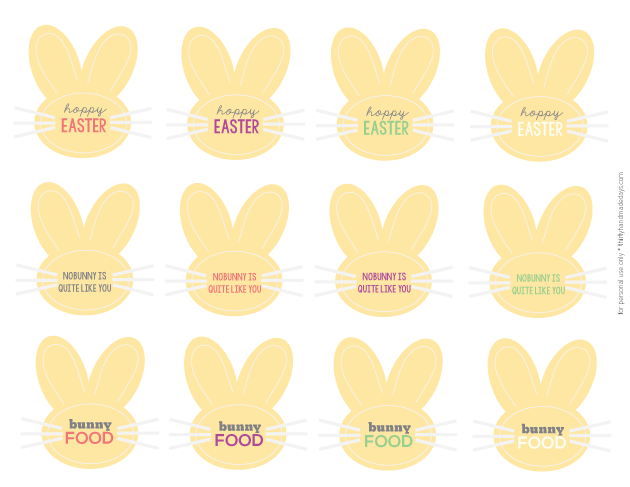 Download and print a sheet of Bunny Tags. For personal use only. Thanks! automatically, according to pre-defined logical criteria. are availlable in alll ranges. SO SO cute – love em! I LOVE them Mique!!! I pinned the printable on my Easter board! Thanks for sharing!! 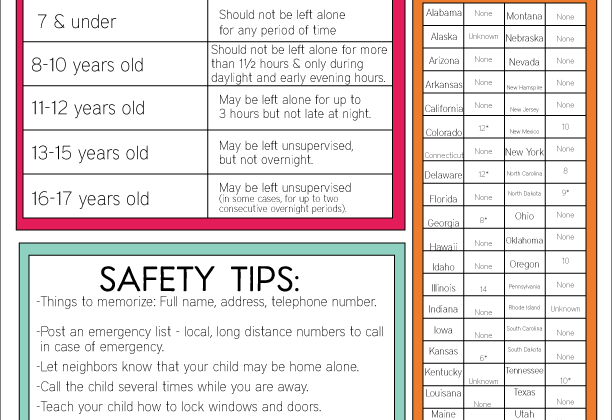 Love the printable’s! Thanks for sharing! so adorable! love those bunny whiskers…this mix looks de-lish! 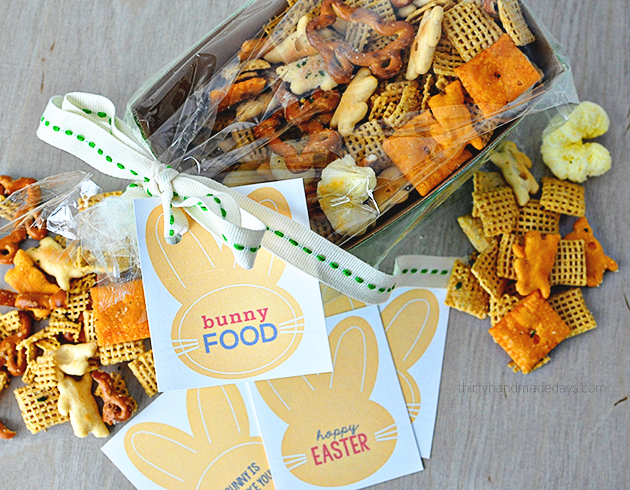 I love the salty, savory treat idea since we always have way too much sweet at Easter. The tags are darling of course!